It is too soon for any of that., 2018, fabric windbreak, H1200 x W3000mm. Why would you even want a beard?, 2018, fabric windbreak, H1200 x W3000mm. 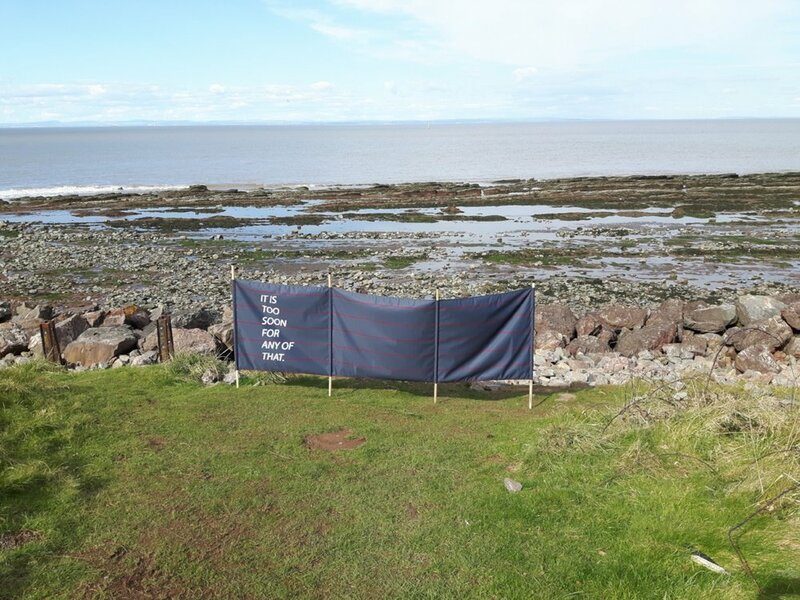 You are only making things more difficult., 2018, fabric windbreak, H1200 x W3000mm. Expanding upon Fox’s ongoing print series Continuum, the Windbreaks were inspired by printing text over a reproduced photograph from a family holiday, featuring himself sat on the beach next to a windbreak. Objects from these family holidays are referenced in these works, such as the original windbreak from What Difference Does It Make?, 2017, an old deckchair now belonging to his father, and a towel previously belonging to his brother. These works combine the patterns from those objects with fragmented quotes, citing conversations with medical professionals during his transition as the source. In a similar way to how these conversations affecting him, the windbreaks act as physical barriers within the locations where they are installed. These pieces also continue a theme within Fox’s practice that explores the connection between gender transition and the crossing of borders and boundaries. This series of works was commissioned by Contains Art, Somerset, as part of their 2018-2019 exhibition season.